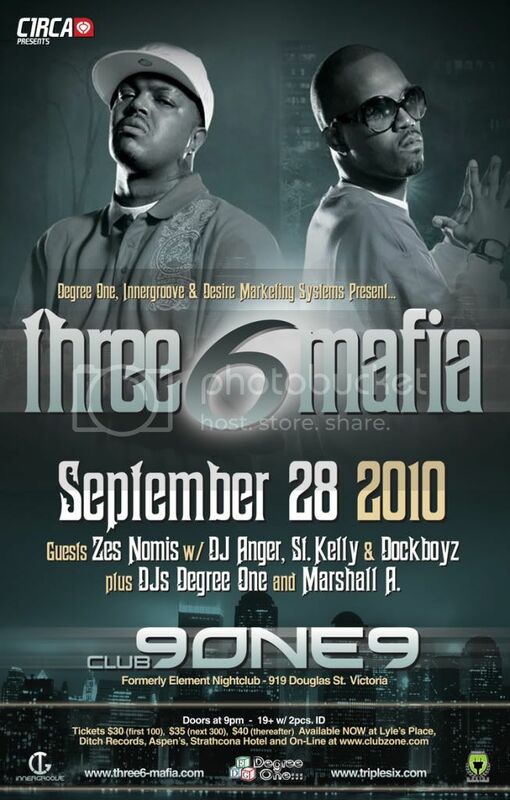 Degree One Events: THREE 6 MAFIA Live in Victoria at Club 9ONE9. THREE 6 MAFIA Live in Victoria at Club 9ONE9. plus DJ's Degree One & Marshall A. - Academy Award-winning American rap group originating from Memphis,Tennessee who won for their 2005 song "It's Hard out Here for a Pimp" for Best Original Song at the 78th Academy Awards for the movie Hustle & Flow. - Their independently owned record label Hypnotized Minds has collectively sold over 5 million albums including 2 platinum & 2 gold, they've had 4 top 10 singles and sold millions of ring tones & and digital singles & the numbers continue to grow! - Collaborated with many well known singers and rappers such as Akon, Outkast, Jim Jones, Sean Kingston,Tech N9ne, Paul Wall Ludacris & Tiesto.